Continuing the exploration of Columbian music in its myriad forms, creative and independent Madrid-based label Vampi Soul have come upon a very special re-issue which focuses on the Afro-Columbian heritage of that country’s rich musical tradition. 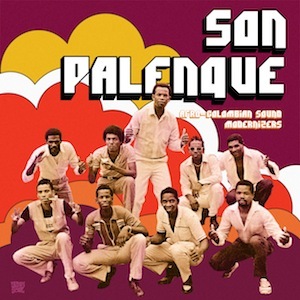 Son Palenque will be completely unknown to most in Europe and even Latin music enthusiasts will struggle to find their releases on vinyl unless they have close connections with Columbia. All the more reason, then, to investigate this fine anthology of the group’s work which spans the period from the early 1980s through to 2012 when the group reformed and began recording once again. This is music that is closely linked to the history of slavery in Latin America with the word Palenque referring specifically to a village or community where escaped slaves lived and there are parallels here with other countries such as Brazil, or Jamaica. Slavery was officially abolished in Columbia in 1852. However, the story of drum rhythms of Africa transported over to Latin America and how they fused with indigenous music styles is just one of the rewarding aspects of this release. There are definite musical connections with Afro-Cuban rumba groups such Los Muñequitos de Matanzas and the lead call and response vocals are not dissimilar to the roots of blues and gospel music in the United States. Melodic collective vocals and catchy bass line are a feature of ‘Palengue Palengue’, the first sing of modern instrumentation emerges on ‘Chofao Apele’ and the links to Cuba are all too apparent on both the chant-led vocal piece ‘Dame un trago’ and on ‘Azuca y Limón’. In order to enhance the listener’s and reader’s experience and enjoyment, Vampi Soul have once again come up trumps with a tasteful gatefold sleeve that inside contains two original vinyl cover sleeves with extremely well documented bi-lingual English and Spanish inner notes from musicologist Lucas Silva who was also instrumental in helping to put the compilation together in the first place. A first rate attempt to chronicle a much under-valued aspect of how music developed in Columbia and one looks forward to other similar-minded projects that shed greater light on the diversity of music on offer in that country beyond the commercial mainstream.